Crew has slept 10-12 hours every night since we’ve had the weighted blanket! I can’t remember the last time he has slept through the night, so this has been wonderful! My daughter was waking up multiple times a night due to being overstimulated and Stacy recommended this weighted blanket. It has been a game changer!! She hasn’t woken up at 2 am thinking it’s morning in a few weeks. She also was having trouble falling asleep, so much so that she would manually close her eyeballs with her fingers. This blanket has also helped her falling asleep. Finally, she was having trouble falling asleep and would scream inconsolably waking up at mdo... the teachers were amazed at the difference this blanket made just on the first day! One of the teachers is even looking at getting her son a weighted blanket. "We got our custom made XL weighted blanket for our oldest last week and I couldn't be more pleased! First, my kid loves how it turned out. Second, Stacy's patience and willingness to work with me for several months before ordering was a blessing. If you've never heard of this company and you have a kid with any kind of sensory issues, anxiety, phobias or sleep problems, please check out their website! You won't regret it!" My name is Misty and my son Hudson is 7 years old. Hudson has sleep apnea and has been on a c-pap machine for a little over 6 months. We’ve seen a huge difference with the c-pap but we still aren’t where we need to be. Hudson tosses and turns all night long. I read about the weighted blanket and decided to give it a try. Stacy let us borrow a blanket to make sure it would work for Hudson before we purchased. We used the blanket approximately 2 weeks and Hudson was sleeping great!!!! Finally I thought until my husband said “how do you know it’s really working?”….So on Thursday October 5th, we took the blanket away. As you can see from his c-pap read out that I have attached, on the 5th and 6th, his sleep quality decreased by almost half of where he was with the blanket. We gave the blanket back on Saturday October 7th and he went back up to 98%. I am now a believer. With a 7 year old, it’s difficult to tell what works but we now have medical proof that it does. Thanks Stacy….this has been a game changer!!!! I am Hudson's mom and we bought a weighted blanket from you almost a half year ago. I was the one that sent you the amazing review on his CPAP machine and the difference at the weighted blanket made. I just wanted to let you know that we try it again last week without the weighted blanket to see if it was making a difference. The results are amazing. You have a truly amazing product. His sleeping went down so much it was so crazy without this blanket. Thank you thank you thank you and thank you again for what you have done for my son. I will never be able to repay you. "We borrowed a blanket from a friend before purchasing, and my son told me "I liked that blanket, it kept me from having nightmares! It gave me goodmares." It melted my heart. It was also the only night in two years that he didn't come down to our room to wake us up. That typically happens 1-5 times each night. I am anxious for my buddy to have goodmares, and for him to have restful sleep which hopefully will help with behavior issues at school. We will be sending his lap mat to school. Fingers crossed and prayers for these wonderful blankets. Thanks again :)"
The blankets comes in a variety of shapes, sizes and textures and I highly recommend trying out to see what works for you. I love how we were able to customize ours as one side is minky (oh, so soft and lightly textured which my sons loves on his skin when he isn’t wearing as much) and on the other size a cotton patterned fabric. This blanket has done so much more than just helped him with sleep! 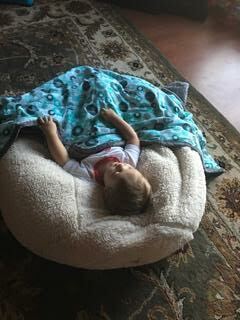 We use it to get him to focus for therapy sessions (lay out and direct him back to the blanket), for comfort for medical procedures (they have smaller versions), for car rides (we had a smaller version made but with different textures on one side) and shhh, but mom loves to use it too! When my son’s movement disorder gets to be too much and he is exhausted, I have been able to lay him on me for comfort and then the blanket on top to calm him body. It truly is magical and I am so thankful and my heart full knowing it is bringing such comfort to my little man. An additional bonus is the care for the blanket is super easy! Simply wash and dry as normal (added to a load of other clothes to balance the weight). I love that I don’t have to provide special needs to it! Experience with Stacy and satisfaction with the blanket have far outweighed my expectations. Thank you Stacy!!" "Let me first say that Stacy is my sister-in-law. That being said, I would like to share my experience with her weighted blankets in caring for my mother who has advanced dementia. I had often heard Stacy tell compelling stories about how her products had helped kids with sensory problems but I had never had a personal connection with her products. I recently found myself caring for my mother. Her disease has progressed quickly and I was distressed when trying to deal with her "sundown syndrome" behavior while my father was in the hospital. I called Stacy and got an emergency blanket sent over night to me. I found that if I could get her under the blanket, it was almost instantly successful in grounding her and calming her down. Sleep would soon follow. When it first arrived I placed it over her shoulders while she was sitting in an armchair. I took note of the time to see how long it would successfully hold her in the chair. Two and one half hours. From my mother who was always restless even before the dementia problems. That night I made her a bed on the sofa, because she was not spending anytime in bed at that point, just wandering aimlessly about the house. Anyway, once I got her under the blanket she was sound asleep in under 15 minutes. I didn't really sleep that night. I sat in the dark watching her sleep, in amazement. I was also terrified that she would wake up and start wandering the house again. But she didn't. She slept for a full 7 hours. A miracle, given her prior behavior. I was able to transition from the living room to a bedroom, and as I said before, once I get her under the blanket its miraculous. She usually gets up around three for a bathroom break but if she doesn't get distracted she returns and goes back to sleep. She's still getting 6-7 hours of sleep consistently. I had Stacy design a new blanket that more closely mimics her old bed blanket. It was a hit. Tonight, she was having a really difficult evening. She ate too much and got a stomach ache. I got some Pepto in her but she was still miserable. It needed some time to work so I pulled out the old blanket and placed it on her as she lay on the couch. Once again, I sit here, watching her sleep in utter amazement. As someone who has found themselves at the end of their rope, in caring for a loved one with these kind of issues, I know the despair and desperation that comes with having no options. These blankets have been so successful that I am compelled to share my experience in hopes of bringing others the relief that my mother and my family have found. There's no guarantee that you'll have these results but trust me it's worth giving it a try. Best of luck with your loved one." Thank you is not adequate enough of a phrase to express my appreciation for your donations. You've gone above and beyond for our auction and to try to help Jordan and I navigate this sensory world, too. You are the epitome of a true advocate for our kids and helping us at a moments' notice! Thanks to your chewelry for saving so many of our son's shirts, providing the sensory input he craves, & for saving my sanity in the process! I appreciate your flexibility, accessibility, & accommodating my many questions & requests within a moment's notice. Most recently the Ghost Sack (which was personally created by your seamstress for Jordan) saved the day when Sensory Overload almost got the best of him at an EEG appointment & again when he had a medical appointment. It calmed him & helped the medical professionals accomplish what they set out to do. Your products are well-made, sturdy, & truly have helped our son get his sensory needs met. Thank you doesn't seem to adequately express our appreciation for you, your company, & your products..."
"Stacy, Thank you so much for the sassy blanket for my daughter! It was so fun to be able to give her something she could get excited about that was also giving her the sensory input she needed. I especially love the pink trim. It matches her room perfectly!" "Your blankets not only give my clients the sensory input they need, but are made with excellent quality that will last a long time. I think it is so great how you cater to each child's specific interests and make something they truly will enjoy using." "I wanted to thank you so much for re-sending the sensory items that were damaged in the first shipment we received. My students are so excited that their "calming sticks" (keychains) have arrived. It is amazing how these help my kiddos calm down when they get upset. I will definitely refer others to your website and I am sure we will be ordering more from your site in the future. "I truly appreciate your speedy response and fulfillment of the product. Excellent customer service! "It is always nice doing business with you, but we never expected for you to go above and beyond for us. You are truly appreciated, thank you!!!" We will definitely be calling Stacy's Sensory again for future purchases. Stacy was super sweet and so was her assistant and they had the products ready within 30 min. of hanging up the phone. :)"
"Stacy was so warm and inviting! She has a wonderful sense of humor which is what initially drew me over to her. I love the Calming and Anxiety reduction neck wrap I bought. I have it around my neck/shoulders right now as I type and feel like I have someone's arms wrapped around me. I love it!! Kudos to Stacy's Sensory Solutions. This is awesome and I look forward to possibly purchasing a blanket in the future!"